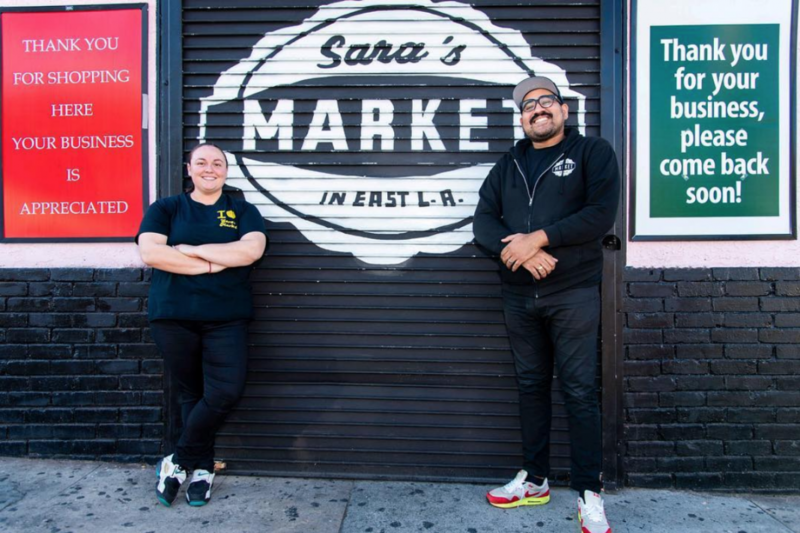 Driving by Sara’s Market when there isn’t a pop-up taking place is kind of like jogging past legendary Los Angeles punk venue the Smell on a Sunday morning—you might catch the name, but you’ll miss the magic. On a recent Saturday, it’s a different story. The storefront, a former liquor store in City Terrace, teems with life. Outside, people line up to buy tacos from a stand set up by Compton-based birria specialists the Goat Mafia, while shoppers inside browse hard-to-find local craft beers and natural wines. It’s a gathering place for people who love food and beer, curious diners from far-flung parts of L.A., and City Terrace neighbors in the mood for a quick meal. Husband-and-wife owners Steven and Sara Valdes—yes, she’s the eponymous Sara—have done their best to foster this delicacy-focused but unpretentious environment. The market has been in Sara’s family for more than 60 years, though when her great uncle owned it decades ago it was called Hilda’s Market. Her parents inherited it when her great uncle retired, and the family renamed it after Sara, their youngest child. Sara and Steven took over a few years ago when her parents retired, although the elder couple has been reluctant give up work altogether—they still come by to man the register, talk to regulars, do some occasional maintenance, and hang out at the pop-ups. Sara took the reins at the store almost reluctantly. Her siblings live out of town or are otherwise occupied, so it sort of just fell to her, but Steven loved the idea. He’s from New York, home of bodega culture, and he says that he long wanted to work at the market. Bodega life has always been second nature for him, ever since he was a kid clacking away on a Fisher-Price cash register. Sara’s Market has stayed the same in a lot of ways—it’s still a corner store for the area, a place where you can duck in wearing sweatpants to get toothpaste and a carton of milk. But Sara and Steven wanted to modernize some things, too, from establishing an Instagram presence to revamping the beer selection. They’re home brewers and craft-beer fans, so selling good local beers was a must. They’ll even drive hours away to pick up offerings from smaller operations like Murrieta’s Electric Brewing or to snag super-limited stouts from Anaheim’s Bottle Logic. As for the pop-ups, the Valdeses started hosting local vendors because customers kept asking for prepared food, and they were inspired by all of the tables of delicious eats at the Downtown Art Walk. It wasn’t easy to get people to come out at first. Established food trucks shied away from City Terrace or wanted to be guaranteed a big crowd. Now that things are rolling and word has gotten out, Sara and Steven are flooded with requests from local vendors who want a pop-up slot. Openings are booked more than two months in advance. The market even had to stop setting out tables and chairs because people started bringing their own 30-racks of beer and treating it like a block party. A lot of meat-focused vendors come through Sara’s—including heavy hitters like Carnitas El Momo and A’s BBQ—but in December the market featured a whole month of vegan pop-ups. “It opened up my mind to a lot of things,” Sara says, explaining how it exposed her to a world of possibilities beyond tofu and soy chorizo. Clearly, that’s not a problem anymore. Sara’s Market, 3455 City Terrace Dr., City Terrace; (323) 268-6809. RELATED: What Makes Some of L.A.’s Best Al Pastor Tacos So Good?